This year, AsiaNextGen awarded a $20,000 grant to the Father’s Heart Ministries to support their Hunger Prevention Program. The circle members chose to address poverty and hunger, and to help those in need as the holidays are approaching. 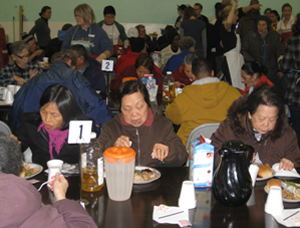 AsiaNextGen decided to award Father’s Heart Ministries after volunteering one Saturday morning and serving a hot breakfast to approximately 700 people, of which 90% of the hungry were of Chinese decent. 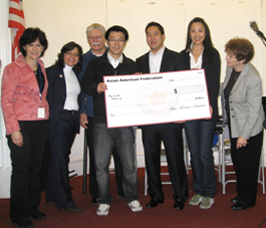 On November 20th, 2010, three members from AsiaNextGen: Hai Chen Wang, Randall Chin, and Michelle Tong presented the $20,000 check to Marian Hutchins, Director of Community Resources & Development, and Carol Vedral, Executive Director for the Father’s Heart Ministries’ Hunger Prevention Program. Also in attendance was New York State Councilwoman, Rosie Mendez. Incubated by the Federation, the AsiaNextGen giving circle currently consists of 10 Asian American professionals collectively engaging in high impact philanthropy by strategically funding critical areas of interest to the community. This is the fourth grant made by AsiaNextGen since their inception back in 2004. Their key goals are to impact social change, leverage monetary contributions, infuse expertise and skills with financial and intellectual capital, and to educate and grow a new generation of philanthropists. Since they are not yet a 501©(3) organization, the Asian American Federation serves as its fiscal conduit. For more information, please visit: www.asianextgen.org.